There’s no more need for Northern Virginia drivers to stop by the repair shop for that biennial emissions inspection. 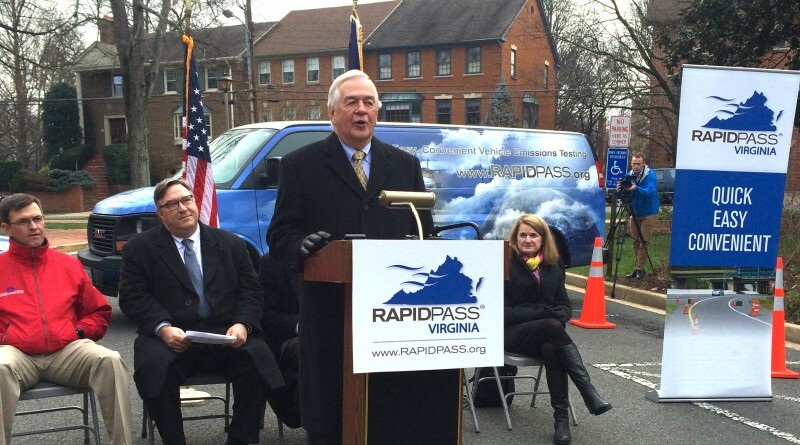 A new program called RAPIDPASS Virginia allows owners of vehicles to meet their inspection requirement during their daily driving routines. Motorists can now drive through one of 150-plus sites throughout Northern Virginia equipped with on-road testing equipment to have their vehicle emissions measured. The inspection locations are in five Northern Virginia cities and counties, including Loudoun County, according to a news release from ETEST Corp., which manages the testing centers. Lawmakers and other community leaders gathered this morning in Falls Church to ceremonially kick off the program. Roadside remote sensing devices can measure emissions as a vehicle passes by, without impeding traffic flow, often without the driver knowing they have been tested. The machines use infrared scanning technology to measure emissions, speed and acceleration. A camera records the license plate number, which can be matched to state vehicle registries. Motorists will be mailed an invoice to cover the $28 cost of the inspection that can be paid by mail or online. ETEST has deployed 15 RAPIDPASS on-road emissions systems, which will be moved around 150 mobile inspection sites throughout Northern Virginia. The locations are positioned on frequently used thoroughfares and will be rotated throughout the month. Weekly site locations are posted at RAPIDPASS.org/locations. For more information go to RAPIDPASS.org, call 1-844-727-7773 or email RapidPass@etest.com.